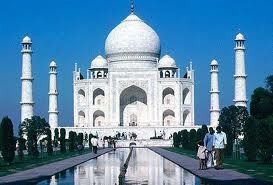 Agra is known, to the world as the city of Taj Mahal. Agra has its roots, dating back to the time of Mahabharata. Agra is situated on the west-bank of River Yamuna, 204 km south of Delhi. The old part of the town, north of the fort, is where the main market place is. The modern township is on the south. Agra has a magnificent fort and many other monuments from the Mughal era, which are major attractions to the tourists. Agra - The city known for the famous monument of love - the Taj Mahal. Taj Mahal was constructed by the Mughal Emperor, Shah Jahan. 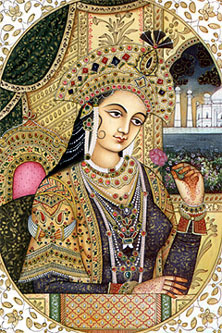 It is said that he built this monument in the memory of his beloved wife Mumtaz Mahal. The Taj Mahal is ethereal at any part of the day - blushing in the rosy glow of dawn or sunset , appearing like a pearly mirage in the moonlight or reflected in the pools of the garden . Perhaps the most moving view of the Taj is from an octagonal tower in the Agra Fort further along the river Yamuna. Agra, the city of Taj was established in 1475 by Badal Singh. Agra finds mention in the Mahabharata as Agraban. Agra city in those days was considered to be the sister city of Mathura which was more prominent than Agraban. Agra came into its own when the Lodhi King choose this place beside the Yamuna to be their capital city. Sikander Lodhi made Agra his capital but Babar defeated the Lodhis to capture not only Agra but also laid the foundation of the Mughal empire.